Road and highway problems in major winter resort areas in Southern California will be studied by a new committee this year which hopes to solve them before another season rolls around. The committee will be an out growth of a Thursday meeting at the California State chamber of commerce building in Los Angeles, San Bernardino County trade manager John H. Fairweather said. Represented on the committee, still to be names, Will be the U.S. Forest Service, California Highway Patrol, State Division of Highways, Southern California Ski Lift Operators Assn., and the counties affected. The new committee will work with James H. Hammond, director of travel and recreation department for the state chamber. Leading the Thursday discussion Will be Hammond and H. H. Bob Roberts, chairman of the Southern travel and recreation committee of the state chamber. Clyde V. Kane, District VIII engineer for the State Division of Highways, said that widening of roads and conditions under which skilled men, in a effect, were being used as parking attendants. Objecting to this practice, Kane said that more off-street parking and was needed. 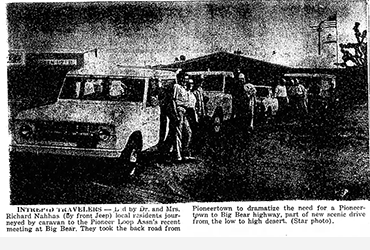 Highway patrol officials also reported extensive problems with double parking and traffic. Fairweather said that the mountains are be inland playground the year around and establishment of parking for multiple uses needs to be investigated. This includes skiing and similar sports in winter at the picnic areas for summer. Persons who wants to visit the snow areas but not use ski facilities also have to be considered, he pointed out. 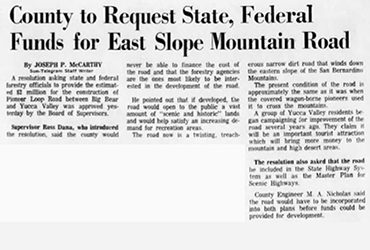 The county training manager also suggested making more highways into loop roads, contending that there were too many “dead ends” in the mountains. These could include Mt. 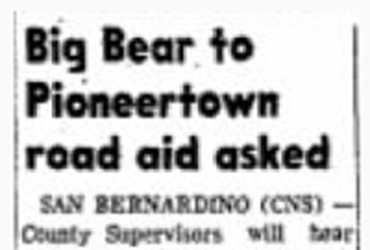 Baldy through the proposed Stockton Flats area to Cajon Pass, and from Big Bear through Pioneertown to the Morongo Valley area he suggested. Highway Commissioner Martin A. Nicholas, Asst. Commissioner George P. Zimmerman and Fairweather where are official San Bernardino County representatives at the meeting.